NOTE: It is important that usuryfree creatives achieve and maintain optimal health and wellness as we forge ahead to do our part to usher in a new age of usuryfree living. Readers are invited to read and share this book review and encourage those seeking to be healthy to buy and read the complete book. In the late summer of 2011, Rodale Inc. published the book "Wheat Belly," which was authored by William Davis, M.D. from Fox Point, Wisconsin. This book has become very popular, probably because its 13 Chapters take a provocative look at how astute consumers can re-educate themselves and learn how to lose weight and reverse a broad spectrum of health problems simply by eliminating wheat from their daily diet. "Wheat Belly" hit the New York Times Best Seller List shortly after it was released. In the Introduction, William Davis writes: "I will make the case that the world's most popular grain is also the world's most destructive dietary ingredient." - In the rest of this article, I will refer to the author by his last name "Davis." Davis is a cardiologist who relies on scientific studies to come up with common sense conclusions about why the modern wheat of this 21st century can best be described as an "unhealthy whole grain." In Chapter 1, titled "Wheat Belly," Davis refers to the fact that it is a common sight in the United States to see people plagued by obesity. His research suggests that the weight gain crisis is directly related to the fact that wheat products dominate our modern diets of this 21st Century. Davis points out that every single meal and/or snack is quite likely to contain food made with wheat flour - simply because wheat is the dominant source of gluten protein in the SAD (Standard American Diet). Davis references his own story and like most people born in the mid-20th Century, he admits he was overweight and diabetic until he removed wheat from his diet. Davis refers to his own condition as "wheat belly" - and he selected this as the title for the book. Davis recommends a radical procedure that he defines as a "wheat-ectomy." On page 10, Davis writes: "Wheat Belly explores the proposition that the health problems of Americans, from fatigue to arthritis, to gastrointestinal distress, to obesity, originate with the innocent-looking bran muffin or cinnamon raisin bagel you down with your coffee every morning." Chapter 2, titled "The Creation of Modern Wheat" makes it clear that the modern wheat being harvested is nothing like the wheat that was grown on family farms prior to the mid-years of the 20th Century. Davis acknowledges that wheat is (and has been) the most consumed grain by humans for generations. However, his research reveals that since the mid-20th Century, scientists have been genetically altering wheat strains to make the wheat plant resistant to heat, drought and specific pathogens and to increase the average yield of wheat seeds per acre. Obviously, these significant genetic changes make the wheat products of this 21st Century very different from the wheat products consumed by our ancestors. Consequently, the modern wheat products are incompatible with optimal health and wellness because they are manufactured from wheat plants that grow only 18 inches tall (dwarf wheat), rather than the four feet tall wheat plants of previous centuries. According to Davis, the biochemical differences in the protein structure of the modern wheat plant commonly triggers a devastating immune response in humans who choose to eat wheat products in their daily diet. Davis explains that by tampering with the genetic make-up of the wheat plant without human safety testing of the altered wheat gluten proteins is contributing significantly to the obesity epidemic of this 21st Century. Chapter 3 is titled "Wheat Deconstructed." In this chapter, Davis deconstructs the super carbohydrate "wheat" and shows how wheat products elevate blood sugar levels, thereby triggering insulin and an access growth of deep visceral fat in the abdominal area of the human body. Chapter 4 is titled "The Addictive Properties of Wheat." This chapter is focused on explaining the psychological pull of wheat and how it can become addictive. Davis also reveals that when people eliminate wheat from their diet, they typically report improved mood, better concentration ability, less mental fog, fatigue and deeper sleep. Chapter 5 is titled "The Wheat/Obesity Connection." Chapter 5 clearly explains the wheat/obesity connection and offers much evidence that the principal trigger for increasing weight is wheat. Davis also warns readers about the gluten-free industry that has emerged whereby wheat is replaced with cornstarch, rice starch and potato starch or tapioca starch - all of which still trigger the glucose-insulin response that is associated with weight gain. Chapter 6 is titled "Wheat and Celiac Disease." Chapter 6 acknowledges that celiac disease is on the rise. Davis suggests that meticulously avoiding wheat products would be beneficial for not only celiac sufferers, but also for others not yet diagnosed with celiac disease. Davis writes 21 pages in Chapter 6 to cite celiac disease as the prototype for wheat intolerance and a standard against which we can compare all other forms of wheat intolerance. Chapter 7 is titled "Wheat and Insulin Resistance." Chapter 7 deals with wheat and diabetes and how closely they are interwoven since diabetes statistics skyrocketed in the mid-1980?s. Davis observes that diabetes and pre-diabetes conditions are paralleled by the increasing numbers of overweight and obese people who consume wheat products that increase blood sugar and insulin. Chapter 8 is titled "Wheat as the Great PH Disrupter." In this chapter, Davis explores wheat as the great PH disrupter by explaining that it is a potent source of sulphuric acid. The presence of sulphuric acid commonly tips the PH balance from net alkaline to net acid and this undermines the bone health of the human body. Chapter 9 is titled "Wheat and the Aging Process." Chapter 9 introduces readers to the acronym AGE (Advanced Glycation End) products - commonly found in older people. Davis points out that the higher the blood glucose, the more AGE's accumulate, thereby advancing the aging process. In summary, Davis suggests that eating wheat products makes the human body age faster. Chapter 10 is titled "Wheat and Heart Disease." In chapter 10, Davis links wheat products to heart disease by explaining that heart disease is a process that is triggered primarily by those carbohydrates derived from the consumption of wheat products. Chapter 11 is titled "Wheat and the Brain." Chapter 11 discusses how our cerebella (brain) health is diminished by eating wheat products. Davis outlines recent research that suggests neurological impairment may be evident in people who are addicted to wheat products. Chapter 12 is titled "Wheat's Destructive Effect on the Skin." According to Davis, the body's reaction to wheat is often expressed through the skin. He suggests that diet is the main cause of acne in the youth. Davis explains that the best way to reduce problems associated with acne is to eliminate wheat products from one's diet. Chapter 13 is titled "Create A Healthy, Delicious, Wheat-Free Life." In this chapter Davis warns wheataholics that they may very well endure a short-lived experience of wheat withdrawal. Davis suggests that by becoming wheat-free, people will eat less and less often. He offers a week-long, wheat-free diet approach and he suggests a variety of wheat-free recipes with accompanying lists of wheat-free products. Finally, Davis offers an abundance of References to support his wheat-free approach to diet. "In 'Wheat Belly,' Davis exposes the truth about modern-day wheat, deconstructing its historical role in the human diet. No longer the sturdy staple our forebears ground into their daily bread, today's wheat has been genetically altered to provide processed-food manufacturers the greatest yield at the lowest cost; consequently, this once benign grain has been transformed into a nutritionally bankrupt yet ubiquitous ingredient that causes blood sugar to spike more rapidly that eating pure table sugar and had addictive properties that cause us to ride a roller coaster of hunger, overeating, and fatigue. Dr. Davis sheds light on its connection to weight gain and fat buildup in all the wrong places, as well as a host of adverse health effects from diabetes to heart disease to immunologic and neurological disorders like celiac disease, rheumatoid arthritis, and dementia. Finally, he presents a compelling argument for eliminating wheat products from the diet entirely, with strategies for making the transition both simple and permanent. Informed by decades of clinical research and backed by case studies of men and women who truly transformed their lives after waving goodbye to wheat, "Wheat Belly" is an illuminating look at a familiar food and a positive course of action to regain health and lose unwanted pounds for good." 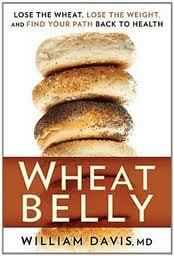 Dr. Michael R. Eades writes a good book review of "Wheat Belly." Another good book review of "Wheat Belly" by Tom Naughton. Darya Pino also reviews "Wheat Belly." MacLean's Magazine interviews Dr. Willam Davis re: "Wheat Belly." I'm sure there are many truths to this book, but as a substitute for Corn which I avoid at all costs, I doubt the wheat is the WORST - lets give that title to GMO CORN and Soy... tied for first place.